“Aliko Dangote was born into a wealthy home in Kano. He got his first degree in Cairo, Egypt. He had always loved trading , and reports say he hawked sweets even as a primary school child , even though his family was wealthy. Dangote is really a very humble person even by the confessions of people who have interacted with him. But Dangote is not the only hardworking Nigerian. He is not the only humble person around . He is probably not the most business savvy in Africa. But he is certainly the richest Blackman in the world . His companies employ over 11 , 000 people directly – not to mention , distributors, contractors and other vendors who depend on his businesses to thrive . Dangote is a blessing to humanity. There is no family in Nigeria today that does not have a Dangote product in their home. If it is not sugar, then it is salt or the house you are living in was built with a Dangote Cement . Everyone has something to do with his business , so like Job he earns a little off everyone and that is the way to get wealthy. Dangote is the 23 rd richest person in the world and is said to be the second most powerful African alive . The question is how did Dangote attain such a height ? Yes, you can’ t take away his hard work and business acumen, but that is only the starting point. The answer will not be found in the Forbes Magazine or on Wikipedia. The answer is in the verse of scripture quoted above : If you are willing and obedient you will eat the good of the land . 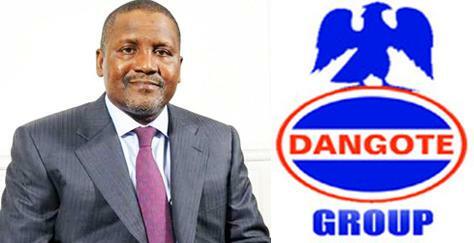 Sometime in the early 90 s Dangote had an encounter that set his foot on the path of destiny. Archbishop Benson Idahosa had some guests who needed to travel back urgently from Benin to Lagos to catch up their flight to the US . Unfortunately by the time the Archbishop took his guests to the airport they were told that the last flight for the day was overbooked and not a single seat was available. As a matter of fact , the passengers have boarded and were about to take off. Idahosa asked for the plane to be delayed a few minutes and walked to the tarmac where he was allowed to address the passengers. He pleaded with them about the desperate situation of his guests and asked that two persons should donate their seats for his guests to get to Lagos . It was there and then, that Papa Idahosa prophesied to him that “ the World will get up for you”. He prayed that God should take his business beyond Africa and bless him beyond measure . Today God has answered that prayer . God destined that blessing for someone seated in that plane that evening. But there was a condition attached to it – Isa 1 :19 If you will only let me help you, if you will only obey , then I will make you rich! Dangote ’ s wealth today was not meant for a Christian businessman who was too proud, too fixated in his mind to offer the “flamboyant man of God”, the “prosperity preacher” his seat . My question is, if you were there on that plane , would you have taken the blessing? Nothing in life is worth fighting for. Your best clothes is someone’s rag,your account balance is someone’s donation at a function, your girl friend/boy friend or fiance/fiancee’ is someone’s Ex. Every single prostitute you see in a hotel or on the street at night was at some point in time a virgin. So what is the squabble all about? Life is too small to feel bigger or better than anybody. We’re all Unclad to death says Steve Jobs. Nothing can save us from it. I hate to see people who Brag about wealth, beauty, intelligence, level of education, fame and material possessions. There’s nothing you’ve achieved in life that no one else has never gotten. There’s only one thing that is worth bragging which is “BELIEVE IN GOD ALMIGHTY”. SO BE GOOD TO YOUR FELLOW MAN AND ALWAYS MAKE FRIENDS.